One undeniable fact about social media is that triumphs–and massive failures–are forever immortalized on the web. In the pre-Instagram years, public personalities could take refuge from prying eyes by closing their front doors. Now, even their private lives are laid bare via social media. The selfie age has given rise to a whole new level of scandal that is historic in both its ability to unveil secrets and in the degree of mayhem it causes. Here are some of this month’s most controversial selfies. 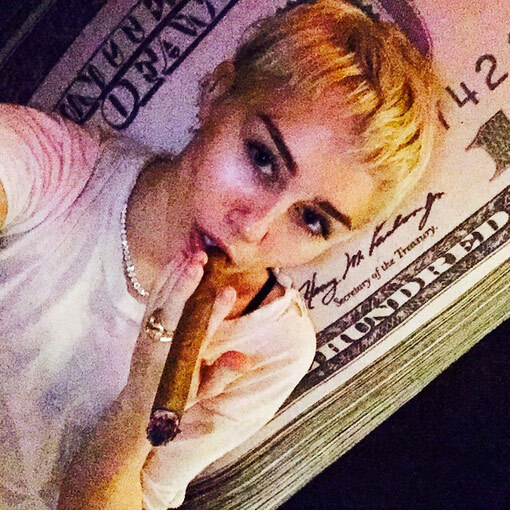 Miley Cyrus made headlines earlier this month, when she posted a photo of herself puffing on a hand-rolled cigar on Instagram. This isn’t the first time a photo of her smoking has appeared on a social media platform. Considering she actually lit up on stage at the 2013 MTV EMAs, this doesn’t seem like such a big deal. However, this is Miley Cyrus we’re talking about––she’s always controversial. Justin Bieber recently posted a shirtless photo of himself on instagram, mocking the rumors that his Calvin Klein ad was photoshopped. Prior to this selfie, there were rumors that the Calvin Klein image was manipulated to “enhance” Bieber’s attributes. However both the brand and his personal trainer denied these rumors. Now, Bieber himself has offered proof that the sizzling campaign image was 100% real. Just today Miss Lebanon, Sally Greige, got in trouble when she appeared in a selfie posted by Miss Israel, Doron Matalon. Because of tension between the two countries, Lebanese citizens are not allowed to fraternize with Israelis. Claiming that Matalon did it to sabotage her chances at the Miss Universe crown, Greige assured her government that it was unintentional on her part.